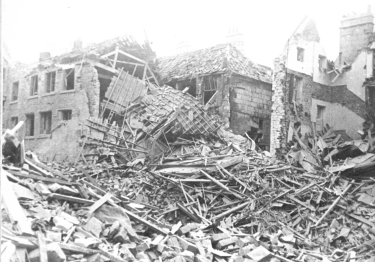 I lived at 31 Roundhill Grove in Southdown, but on the night of the blitz I was staying with my friend Pam at 22 Roundhill Grove. The house at the end of the garden at number 31 had a direct hit. A Mrs Young and her two children were killed in their house in Oriel Grove. That bomb also damaged my house quite badly. We all went to Combe Hay to stay with a relative of Pam's Mum for a while after the blitz. The other thing I remember was that we always stayed in the bathroom when the air raid warning sounded instead of going to a shelter. It is a period I will never forget, and I hope that my children and their families never experience anything like this. Cynthia was lucky to be staying with her friend. Number 22 where her friend lived was only slightly damaged. Cynthia's own address, Number 31 was more seriously damaged, and if she had sheltered in its bathroom, it might not have protected her. Cynthia has remembered their address of the house at the bottom of her garden wrongly. The road at the bottom of her garden was Melrose Grove, and the Mrs Young lived at Number 19. On a map, Oriel Grove looks as if it continues on the other side of Southdown Avenue, but when it crosses the road it is no longer Oriel Grove, it is called Melrose Grove. Again Cynthia has remembered the right area but not the exact street. The Technical School was in Weymouth House which the City Engineer placed in Abbey Green just a short distance from Manvers Street (as compared to The Technical College in Lower Borough Walls and next to St James Church). The church would probably be St John's Church, on the junction between Manvers Street and South Parade. St James Church, at the end of Lower Borough Walls and therefore near the Technical College, was Church of England and not Roman Catholic.